We are pleased to announce that we will be running FREE Sound Production Courses again this Autumn! During this course, you will work towards achieving a BTEC Level 3 Award in Sound Production. This program will give you hands-on experience with Logic Pro X, microphones, midi recording and a host of other useful skills and knowledge that will help you in home recording or set you up for further study in Sound Production. 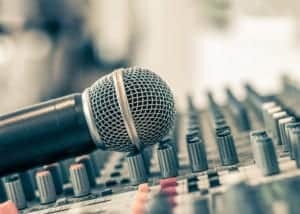 On successful completion, you will be awarded a BTEC Level 3 Award in Sound Production to evidence your new-found recording abilities and throughout the whole process, you will receive guidance and support from one of AMS’s specialist trainers. When completing the application form please specify which date you would like to attend so we can book you accordingly. Spaces are limited so make sure you book in early to avoid any disappointment. Please note that this course requires some academic work to be completed in order to gain certification. The deadline is Friday 10 November 2017 at 12:05.